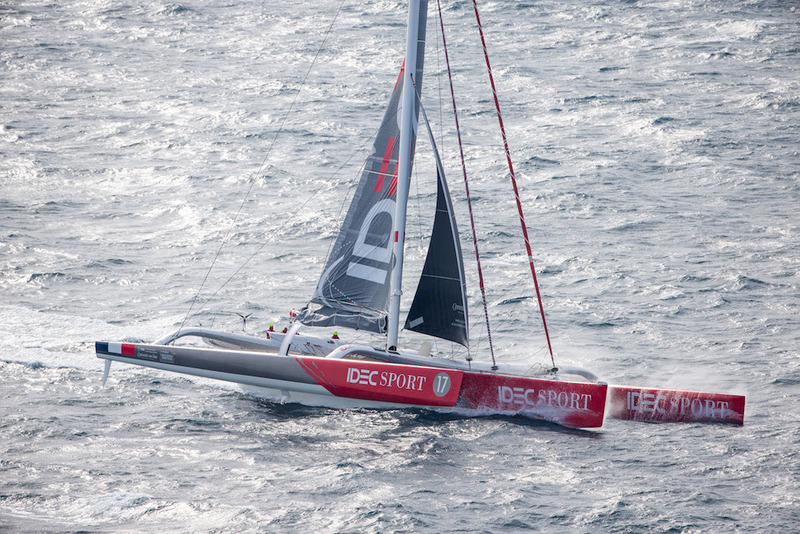 200 miles south of the Azores, IDEC SPORT is starting the final stretch of her round the world voyage in favorable winds, which they have managed to pick up, getting the timing just right ahead of a front associated with a low-pressure system. 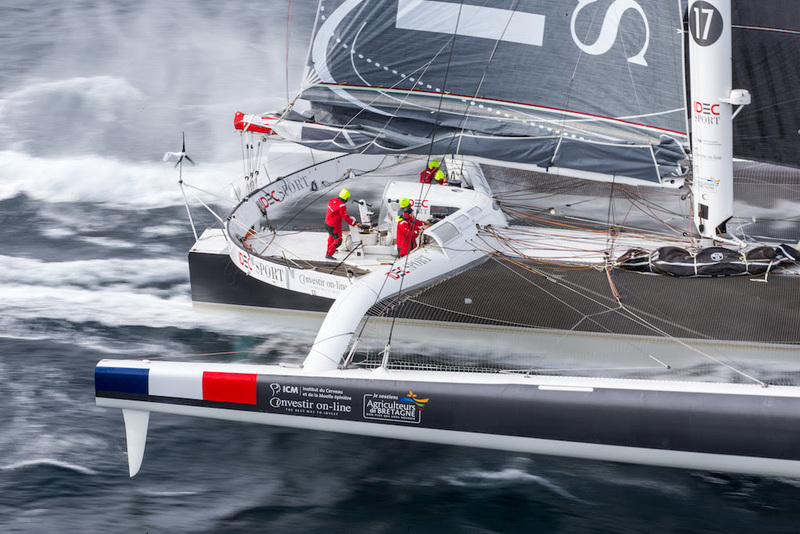 With the speedo firmly stuck at thirty knots, Francis Joyon, Bernard Stamm, Alex Pella, Sébastien Audigane, Clément Surtel and Gwénolé Gahinet are on the home strait at the pace they set in the Southern ocean, maintaining high speeds, while remaining vigilant as they face the elements. 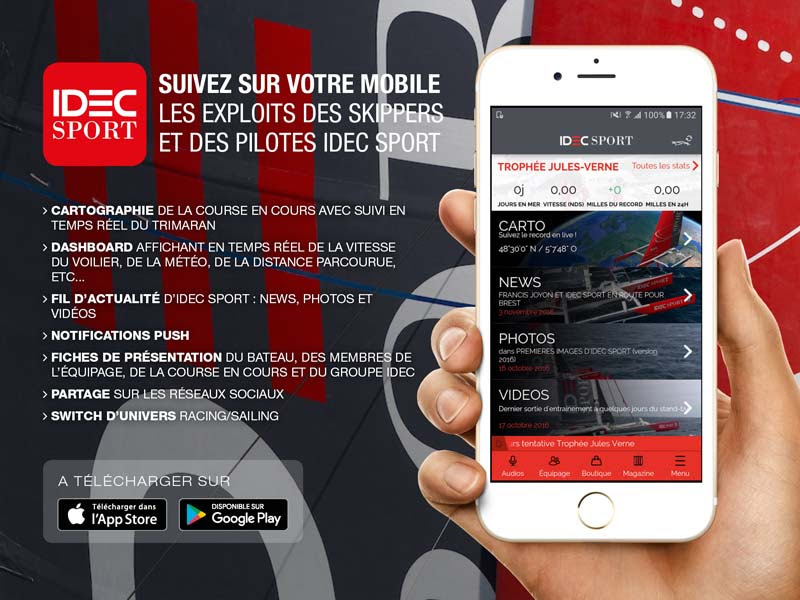 With 1300 miles to go to the finish, they are now expected on Thursday morning in Brest after forty days of racing against the clock, as they enter the final phase of the Jules Verne Trophy attempt. "We're very lucky, as the weather is slotting into place. 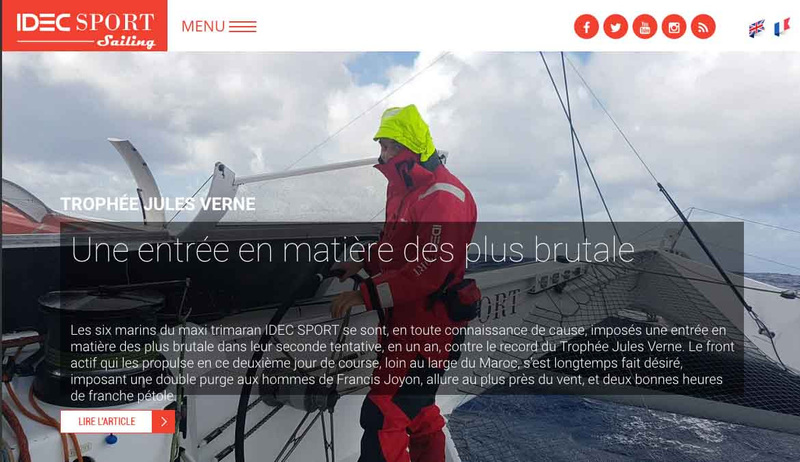 I think Francis must have spoken to the isobars," - joked Bernard Stamm, who has every right to be pleased, with IDEC SPORT sailing smoothly on the North Atlantic swell under mainsail and gennaker in a 25-knot SSW'ly air stream. 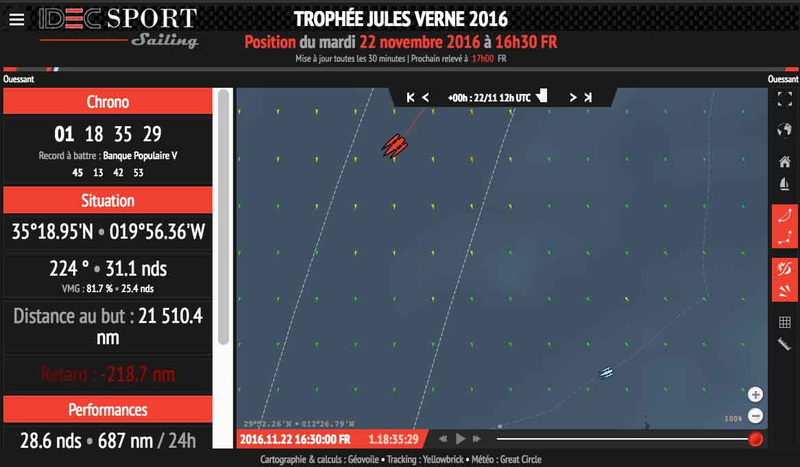 Approaching the Azores, everything is falling into place to allow them to continue to keep up the pace all the way to the coast of Brittany, as they sail practically on the direct route, clocking up miles in the most efficient way. "Taking advantage of the weather that we are being given"
"We are entering a SW'ly air stream. It's more or less a straight line at full speed to Ushant in strong winds. It's up to us now to ensure we don't make any mistakes. We won't be putting our foot down like we did in the Indian. We want to preserve what we have built up, but it is great to finish at such high speeds. We're all remaining focused not to take excessive risks with the gear, which needs to work properly until the finish. 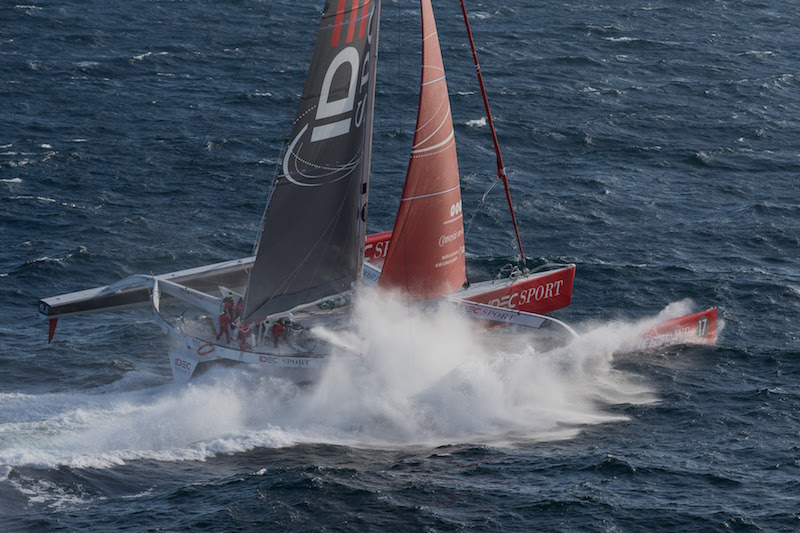 We are remaining very upbeat about this incredible weather opportunity," added the Swiss skipper, who is about to finish his sixth round the world voyage. "At the moment, what counts is going fast all the time to stay ahead of the front," - confirmed Francis Joyon, who is right to feel confident about what lies ahead. “We may have to change tack at some point. We'll see. We'll be passing quite close to Cape Finisterre before crossing the Bay of Biscay with the wind and the seas on the beam." 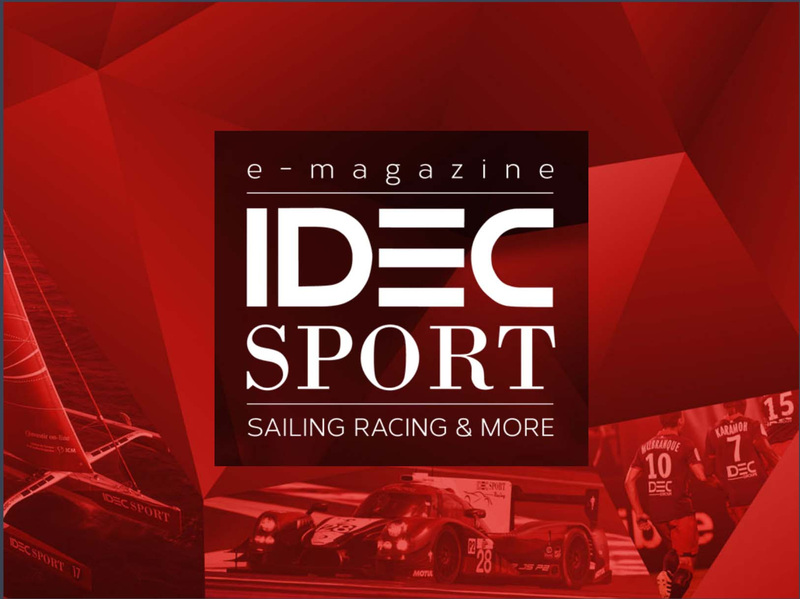 Just like the five crewmen accompanying him on this round the world voyage, he can also count on the qualities of IDEC SPORT and her ability to accelerate and keep up high speeds over long distances. 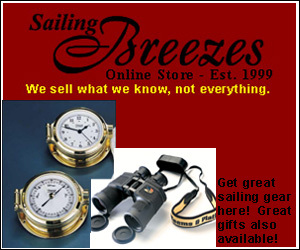 We all remember that they managed to stay on one tack for eleven days, which allowed them to clock up distances in excess of 800 miles a day in the hostile southern latitudes. "We found out a lot about the boat during this voyage. She has made a lot of progress, because her sails are bigger, but also because we now know how to trim her more precisely to gain a few extra knots. She is an extraordinary boat, and is still at 100% of her potential with all her sails operational," he explained, while remaining well aware of the obstacles that lie ahead and could endanger what they have achieved. "By nature, I am very cautious, and until the line is crossed, we are not out of the woods. There are risks all the way to the finish. But we are well positioned in relation to the low and the weather should allow us to get to Brittany without hitch. We hope to finish in less than two days from now."